The policy of obligatory medical insurance is a document confirming your right to free healthcare in state medical institutions. It should be available to every citizen. It is usually prepared by the company. Students. Pensioners and disabled people just have to draw it yourself. How it to make? In accordance with the new act on the acquisition policies of OMS you have the right to choose their insurance company. This can be done by studying different options for your residence with the help of the website of the Federal Fund of OMS. From the home page of the official website go to the "Territorial funds OMS, "click on the map of Russia. Then on the map choose your region, Krai or Republic. You will be redirected to your regional offices with addresses and phone numbers of the service points of the population. Depending on the region, you can have a choice of several insurance companies or only one. On the received telephone call to the selected Foundation and to make sure they work. Come at this time with the passport and the insurance pension certificate. Children under fourteen years of age will need to provide the birth certificate instead of a passport. 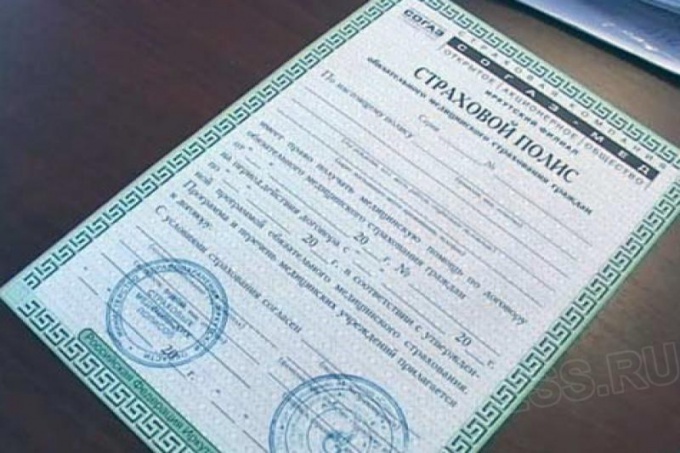 Complete the application for registration of the policy of OMS on a special form, which you will be given the employee of the insurance company. After submitting the application will receive from the Fund of the provisional certificate about the OMS. It must be shown, if you want to avail of medical services before your policy is ready.When you apply you can also choose how you want to get a policy in the traditional paper or plastic card. Through the month once more please contact the office of the insurance company, your policy should be ready by that time. You can also call or e-mail from a member of the Fund on the readiness of the document. If you do not live at the place of registration, it does not matter - you can take out insurance in the insurance company's actual place of residence. In connection with the reform until 2014, there is a replacement of insurance policies. So even if you now have this document, you still should contact the insurance company and redesigned it.